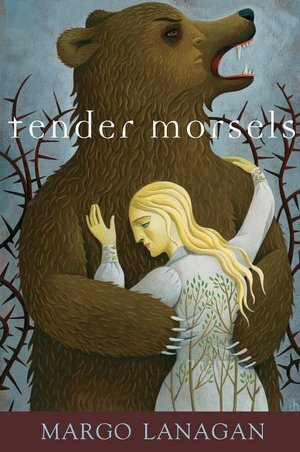 Tender Morsels is at once painful and tantalizing. It challenged me as a reader in ways I haven’t been, in a very long time. It is a bitter tale, one that takes time with its telling because you are expected to split and grow like the main character, where you nurture an understanding, a difficult knowledge, that is at once tender, raw, and true. Margo Lanagan’s book is far more than a simple retelling of the Snow White and Rose Red fairy tale. It takes the basic arc of the story and rips out the seams, sewing a completely fresh take on that classic fable. The story starts off with Liga, who endures an unspeakable trauma at the hands of her father, and again by a gang of local boys. The lens in these moments is always held away from the scene so we develop our comprehension of the situation through Liga’s evasive and fragmented language, her speech even garbled at times. Through her fractured telling, we are able to piece together what horrors she is coming to terms with. From all this terror comes some brightness: two babies. Even so, Liga attempts to end her life but magic intervenes and sends her to a parallel world where all the people who wished her ill, no longer exist, where money is never used, and alcohol is unknown. It is in this parallel safehouse of a world that Liga raises her two daughters, Branza and Urdda. Through raising them she seems to regain aspects of her own humanity, although the stronger sense of self she develops, the less the dream world she created for herself seems to be enough. As her daughters grow, they too become impatient with the safety and restraints of Liga’s world and after encounters with strange, foreign bears who wander at the edges of their world, they develop a desire to learn what lies beyond their boundaries. For me, the relationship between the sisters was the lynchpin of this book. They are very different from each other, but Lanagan has managed to weave a delicate balance between the two that brought to mind my own strong relationship with my sister. Branza and Urdda are constantly challenging each other, pushing slightly at one another’s borders as they seek the physical edges of the world that binds them to their mother’s fears of reality. One of the provocative elements of this book were the many different points-of-view through which the story is told. I found myself impatient when the focus was taken away from Liga and her daughters. Although this took some adjustment at first, I grew to appreciate the sensitivity that Lanagan took in crafting this narrative and how she let the poetics of language connect the themes, coaxing forth a complex meaning from the story. The author is an incredible wordsmith, twisting the tongue in all directions, changing the dialect from character to character. She also has the frustrating, yet uncommon fortitude, as a writer to leave loose ends and not tie up each character’s story with a neat, little bow. In the moment, I agonized over this lack of knowledge, but then I realized it was Lanagan’s intent to leave the narrative flawed and open. I respect and admire her prudence as an author who helps her readers to push at their own limits.